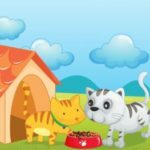 Why should you stop free feeding your cat? 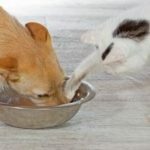 Dogs and cats indeed CAN regulate their food intake when allowed free access to food. However, they are capable of doing so if, and only if, they are active throughout the day. Back in the day, we had fewer lap cats and an almost nonexistent indoor cat population. Things have changed since then, and, even if we know indoors is a much safer environment for a cat to live in, keeping cats indoors comes with a price – reduced activity. How many times per day do you play with your cat? Nine? Ten? If not, your cat could seriously benefit from scheduled meals. But that is not all. Here is a list of 6 reasons why your cat should be switched from free-choice feeding to scheduled meals. You can control how much food your cat eats. If you have one cat, you might be able to keep track of how much fresh food you add every day. However, our experience shows that cat owners can rarely answer how long the pack lasts, which also means they do not know how much food they add. That is, if they see the bowl is half empty, they add more. How much? As much as necessary. If you have more than one cat, scheduled meals are the only way to know how much each cat eats. Your cat will lose weight. Has your free-fed cat gained weight? It’s because the food is always there, and your cat may not have anything better to do than eat. Owners who feed their cats on a schedule claim that their cats spend a majority of their waking time begging for food. That is actually what cats do in the wild, too. Of course, they are not begging for it; they are hunting. In the house, hunting is transformed into playing. If you play with your cat regularly, not only will he be fit, but he will also panhandle for food less often. You can learn more about the benefits of playing with your cat here. Food can become a training or behavior modification tool. What do you do if you are having trouble introducing two cats? You separate them and let them see each other during meal times only. How do you train your cat to accept petting more often? You pet your cat, and, if he responds nicely, you give him a treat. How do you teach your cat to sit? You wait for him to sit and then give him a treat. How do you do all that if you are free feeding your cat? Your cat is not a dog, and he will not work for food if he can get some over there, for free. Your cat will understand his daily rhythm. In the wild, cats go through the same hunt-rest pattern over and over again. They wake up, they go hunting, they eat what they caught, they groom themselves, and they go back to sleep to regain the energy lost during the hunt. But what happens if the food is already there when he wakes up? This means there is no energy spent on gathering it and, therefore, there is no energy to regain afterwards. As a result, the pattern changes from “hunt-eat-rest” to “rest-eat-do nothing,” which creates a solid groundwork for a series of boredom-related behavior problems. Is your cat troubling your sleep at night? It’s because cats naturally know there is no reason to hunt in the dead of the night. Their prey is sleeping then. But the freely accessible food bowl isn’t. Eating in meals is natural for cats. Your cat’s digestive system is literally made to eat on a scheduled pattern. Unlike cows or goats, cats do not graze; their daily rhythm is carried out on a hunt-rest basis. He is a hunter. He preys on and consumes his catch. His digestive system then takes care of it and waits for the next meal which, in the wild, surprise, surprise… may not arrive that soon. Scheduled feeding is the only way to feed your cat a wet diet. We will not try to convince you to switch to a wet diet, but know that you simply cannot use a wet diet if you choose to free feed your cat. Any leftovers of canned or raw diet should be removed. Was this impressive enough for you to switch your cat from free-choice feeding to scheduled meals? We hope it was. 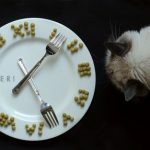 You can also check our other article in which we talk about how to switch your cat from free-choice feeding to scheduled meals. 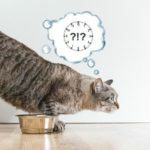 How often do you need to feed your cat? In case you were wondering, it’s best to provide at least 3 to 4 meals per day. At least? Yes, in nature, a cat could have up to ten meals, but would that be convenient for you? We feed our cats three times. The first meal is in the morning, the second meal is in the late afternoon, and the third meal comes a few minutes before we go to sleep. Of course, you can set your own schedule, but the best practice is to spread the meals out evenly throughout the day.